Each release of the Children Ear Training courses will feature a different traditional song. This is excellent kids ear training book because it teaches not only good ear training skills but also helps develop letter and number cognition as well as relating letters and numbers as symbols to make statements about things. This is exactly what you do when you learn algebra. Prepare you child so that they see the usefulness of advance mathematics because they already know how it relates to music. This is a bit of a departure for Muse Eek, where I aim most of our courses to serious musicians. But it occurred to me that I was leaving an important group; serious musicians of the the future: children. Children are learning machines. They can pick up just about anything if they start early enough. From the moment they can hear sounds even in the womb! They are learning. So here is a course to teach those very young ears how to hear and understand music in a fun, simple way. And while I was putting it together I also realized that there are quite a few adults out there who have issues with ear training, that this series could really help. 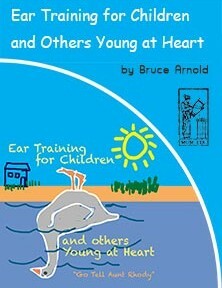 But This Children Ear Training Course is for Anyone! Learning the melody singing the letter names. Learning the melody singing the solfège. Then Learning a harmony part with words, letters names, degrees or solfège. Singing the melody, then guessing random notes by using letters names, degrees or solfège. Singing the melody then singing random pitches when prompted using letters names, degrees or solfège. Singing the harmony with words, letter names, degrees or solfège. This help you hear and sing pitches and know what you are singing while another part is played. Work on singing the bass part with letter names, degrees or solfège which develops a better sense of key which is crucial for good contextual ear training skills. The traditional song “Go Tell Aunt Rhody” a simple song with the same melody for both the verse and the chorus is used. This song will be performed in the key of C Major. It contains only five notes: C, D, E, F and G. The three main components to the audio tracks are: Melody sung by voice, Bass played by Electric Bass or voice and Drums. Since students may have different issues with singing this song, many different combinations of the three main components are presented. In order to ingrain a deeper understanding of the melody it will be sung using degrees, note names and solfège. This will instill a natural cognitive recognition of which notes are being sung. By working through a series of tunes in this way one can instantly know when hearing a melody which notes are being sung in relationship to a key center. Some students may already have experience with one or more of the treatments listed above so they may want to vary the way they practice. This course comes with 4 hours and 45 minutes of audio files in the form of MP3s. These MP3s will teach you to recognize the notes that are played by their unique sound within a key center. But most importantly this is done in a fun way where you are really just singing a melody, guessing a note or are asked to sing a note. This course limits the number of notes you are learning to five. This helps a child or older person concentrate on only a few notes in one octave. You will be surprised how quickly you pick up the pitches and how they stay in your memory because you are also reinforcing this by singing the melody every minute or so. Remember that learning music is like learning a language. It takes time for your mind to catalog the unique sound of each note and even longer to coordinate your voice in a natural way to the sounds you hear in your head, or coming at you from an external source. Not everyone learns at the same pace, so don’t get upset if you take longer than someone else. This doesn’t make you less of a person or musician; it just means that through this Children Ear Training course you have found a weakness in your ability and through practice you will fix this weakness. That is a good life lesson for a child or an adult. These audio files give you plenty of examples so that you won’t memorize the order of the notes you need to identify or sing. Learn the melody with words, letters, numbers and solfège really ingrains what pitches are being used within a key center. This will happen very naturally because you mind will remember the sequence of pitches and connect it directly to the melody. Then with the additional MP3s that have you guess or sing a pitch you will see that you are able to recognize the pitches quickly. So you can see that we really tried to cover all the bases with the Children Ear Training book. I think your child will be educated and have fun at the same time! Have a story or a review you want to submit. We would love to hear from guitar beginners so please send us an email. 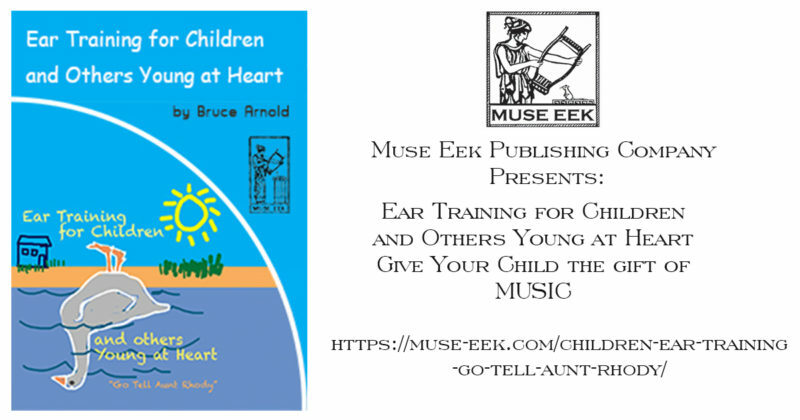 This entry was posted in Ear Training and tagged Children Ear Training, Ear Training for Young Adults, Ear Training for Child, Ear Training for Youngsters, Teach my child music, ear training for kids, kid ear training, kids ear training book by Bruce Arnold. Bookmark the permalink.